Q: What is ODU’s background in meeting military requirements? A: Since its founding in 1942, ODU has developed and manufactured reliable connector systems for the military and defence sectors. These high-quality, innovative products are generated for the global market. ODU Connectors are involved in many different sectors of the defence and military market including soldier communication systems, different programmes in the category of “Soldier of the future”, night vision systems, radio systems, radar systems, sonar systems for submarines, nuclear submarines, weapon systems, portable navigation systems, launchers/rockets, aviation, naval vessels and armoured vehicles. ODU has also developed a new connector series especially for the “Soldier of the Future”. This ODU AMC series makes all of the individual components for the solider of the future “pluggable”. “Wireless” is not an option here because of speed, stability and data security problems in data transmission. Multiple interfaces are always a risk, and system connectors that are 100 percent reliable are particularly needed for the “Soldier of the Future”. Q: What are the advantages of ODU for customers? A: ODU is a medium-sized business with a high level of motivation, flexibility and innovation with very high level of employee retention. The company has more than 60 years of experience in this sector and is the sole-supplier to over 100 companies around the world and leverages expertise and knowledge derived from approximately 30 development contracts each year. ODU has all the necessary technologies under one roof, so we can respond to our customers requests flexibly and quickly. Design and development, tool manufacturing, injection molding, electro-plating, stamping, turning, automated assembly and cable assembly are all in our facility in Mühldorf, Germany. ODU connectors are certificated acc. to: ISO 9001, VDE, Ul, CSA, VG, MIL, ISO TS 16494. ODU is involved in soldier modernisation programs – worldwide. In this field connectors must meet a number of rigorous conditions including ease-of-use and reliability under the most extreme conditions. ODU connectors meet and often exceed these by providing a reliable connection under the harshest of conditions. If you are looking for an innovative, robust, secure and reliable connector solution in the military/defence area – ODU is your partner. Q: What is on the horizon? A: ODU continues to work on new connection systems to meet all requirements for the future. The most important requirements for the new generation of connection systems are: reduced weight, simple, intuitive use, self-sealing connections, suitable for cleaning in the field and Reduced costs. 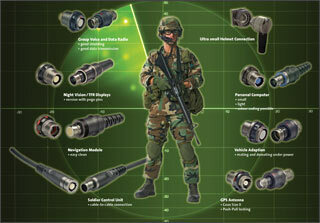 As a result of this – ODU developed the new Military Connector Series ODU AMC – Advanced Military Connector. The goal of the new ODU AMC series is to do more than just give the “Solider of the Future” individual connector components. ODU will provide a complete connector series that is perfectly tuned to the different requirements on all interfaces of the soldier. Connection system, including the necessary cable and assembly, and, where needed, individual extrusion or special potting - in short, the complete wiring harness needed. Q: What are the advantages of ODU’s AMC Advanced Military Connector for Customers? 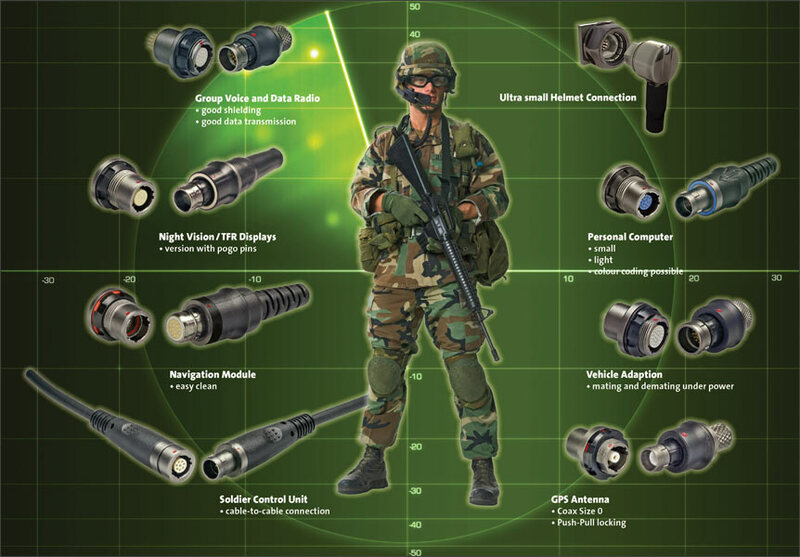 A: As the requirements for tough, reliable soldier systems evolve, ODU develops new connector systems such as the Advanced Military Connector for the ever-changing military environment. The extremely rugged and solid AMC is useable under the most hostile conditions and has a number of key advantages: push-pull locking or pull-off features, optimized mechanical keying, colour keying is possible, it has excellent 360° shielding features and offers watertight protection class IP 68 versions with spring loaded contacts and easy cleaning are available. In the future, the new ODU AMC connector series will allow our customers to profit from extremely flexible, powerful and yet economical connectors for the most stringent demands in military technology. The ODU AMC provides weight reductions of up to 60 percent compared to standard push-pull connectors. The use of aluminum results in an extremely robust housing that can stand up to the most difficult conditions. The mechanical coding options allow perfect and blind insertion with no restrictions. Incorrect insertion is impossible. Q: What about customer specific solutions for unique requirements? A: In addition to our standard products, ODU is a specialist of customized connector solutions. In this area we work very closely with the customer to meet his exact requirements. Our motto is: “If it’s not out there yet, we’ll work with you to develop it!”. For the other areas of military technology we have previous developed a range of different Connector Solutions including for Rocket-Propelled Grenades and the MILAN and HOT missiles and a customised connector forming water tight interface between the soldier gun and laser module. The exact implementation of the specifications for the particular application when it comes to design, function, costs and exclusivity is the basis of customized solutions.